The week and the weekend didn’t exactly go to plan but that is another story maybe in the future sometime. Anyway, so on Sunday, Chris and I decided that we would miss church for the morning and go off an adventure. Now it’s become a bit of a joke for one of us to turn to the other in the morning and say “shall we more work and go on adventure?”. Well missing church is a little less job-threatening than missing work! Chris tapped away on his phone and in the end found somewhere slightly different to go. We headed down the bypass and towards Husborne Crawley. I’m sure it probably wasn’t the most direct route to where we were going but it did add to the adventure. After a few guessing games including me guessing the telephone codes to try and work out where we were (I can’t help it!! My dad was a telephone engineer so it was often a conversation on holidays and then I worked in customer service processing orders so it was handy to know what the full dialling code should be if numbers were missing etc – NERD!) 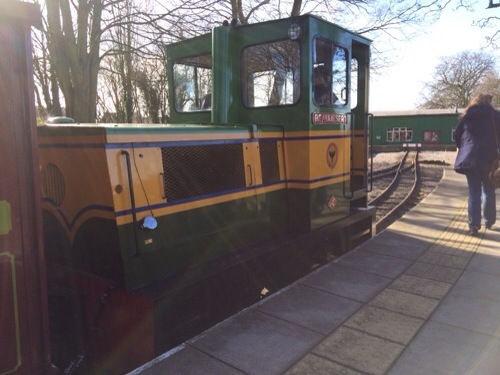 we ended up at the Narrow Gauge Railway at Leighton Buzzard. Unfortunately it was a diesel train rather than a steam and because it being early in the season the train only went half way along the route and back rather than all the way to the end and back. Some bits of the ticket office, station and cafe all could do with a lick of paint and an update but the staff are lovely and friendly and made us feel really welcome. The railway is mainly staffed by volunteers (from what we could gather) and on a Sunday once you get on the train watch the footballers in the field next door – they get really puzzled when they can hear the whistle being blown but it’s nothing to do with their match. The trains were clean and tidy and I can imagine it being quite busy during the summer. The guys in the cafe were nice and welcoming but if you wanted more than a cup of coffee or a cake there wasn’t much choice. As part of our adventure, we then headed to the local Harvester for lunch. We did have to wait to be seated but it was Sunday lunchtime so we expected a bit of a delay. Our waitress was lovely and friendly and checked on us quite a few times even though it was busy which was good. Following lunch we headed home again and ended up watching more of the Olympics when we got in. The Women’s Slopestyle (?) was on and it was scary watching some of the girls have to pull out the race – one time the girl took the jump but hadn’t got enough speed up so ended up landing at the bottom of the jump – she should have landed on the safety crash mats but actually she missed them. It’s such a fast race that even if you could pick yourself up and carry on, the race would be finished within seconds. Has anyone else been enjoying the Olympics? Do you have a favourite event? This entry was posted in Adventures, Church, Food, Friends and Family.